The capital markets play a significant role in the investment and continued growth of the commercial real estate sector. The outlook of the financial landscape and what we can expect from the capital markets in 2016 has a significant impact on investment decisions this year. In 2015, we saw a stable, strong financial landscape with ample capital sources available to meet the demand and the continued growth of the market. However, the question remains – What can we anticipate from the capital markets in 2016? This brief overview of the dynamics that will likely impact 2016’s financial climate is based on 42 years of experience in providing financing throughout the real estate industry. Capital Availability. The number of capital sources available will remain strong throughout 2016. With that said, we will continue to see the gap widen between the costs of capital available in major metropolitan areas and in small metros. Most of the large national lenders have been investing and will continue to remain active in U.S. major metropolitan markets, with the small exception of those heavily influenced by oil. Regional and local lenders will remain the option for the smaller metro areas. This division of investor size creates a disparity in costs. Smaller markets have a higher cost of capital than larger markets due to the lack of competition from large, national lenders who choose not to operate in those smaller areas. Interest Rates. As we closed out 2015, the Federal Reserve began its first steps in increasing short-term interest rates and predicted future increases throughout the new year. Because real estate pricing is more heavily tied to long-term rates, we anticipate that this initial move by the Fed to increase short-term interest rates may not have a significant impact on commercial and investment real estate lending. In fact, when the Fed announced the short-term rate increase in December 2015, the 10-year Treasury bill was at 2.30 percent. As of January 25, it was at 2.01 percent. The long-term Treasury’s have become a global option that is often influenced by many factors unrelated to U.S. short-term rates. With this in mind, the recent increase in short-term rates or a slight increase in short-terms rates throughout the course of the year will not have a significant effect on capital markets in 2016. Cost of Capital. Spreads that previously increased or widened in the third and fourth quarters of 2015 have subsequently decreased, leading to a lower all-in rate or total cost of a mortgage in 2016. For example, large life insurance companies providing financing on large low-leverage loans at the end of 2015 were originated at prices with a 1.90 percent spread over a 2.30 percent 10-year T-bill for an all-in rate of 4.20 percent. As of late January, the pricing is 1.65 percent spread over a 2.01 percent 10-year T-bill for an all-in rate of 3.66 percent. This supports the thought that we should be careful assuming the cost of capital will definitely increase in 2016. That being said, the stricter risk retention legislation and regulations affecting the commercial mortgage-backed securities market will add cost to the CMBS process, potentially affecting the cost of capital in 2016. To what extent these changes may impact the cost of capital is yet to be seen, but it is important to keep in mind when determining the anticipated cost of capital this year. Investor Sentiment and Focus. A December 2015 survey of the 60 top commercial and multifamily mortgage origination firms by the Mortgage Bankers Association found that 97 percent of respondents expect lenders to have a strong or very strong appetite for loans in 2016. In addition, 67 percent of these respondents anticipate volume to increase by approximately 5 percent over 2015 levels. This sentiment by the top commercial and multifamily origination firms is consistent with 10 institutions we surveyed directly. Each of the firms surveyed further concluded that they also anticipate strong growth in terms of the number and volume of loans originated in the new year. 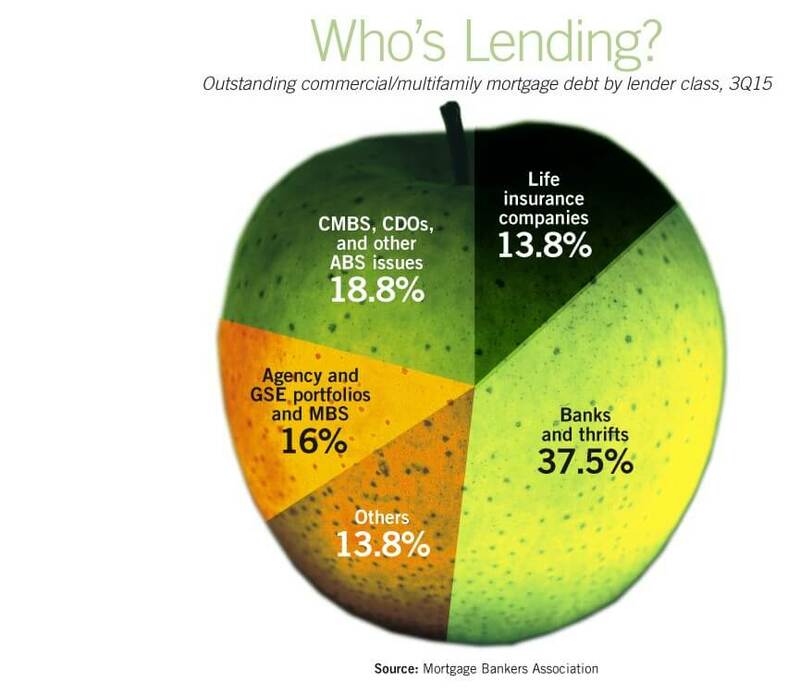 The four major investor groups — banks and thrifts, CMBS, agency/GSEs, and life insurance companies — represent 86.2 percent of the $2.76 trillion of current outstanding debt on commercial and multifamily properties. The majority of the respondents to the MBA survey feel that this is in large part due to the high levels of maturing loans that were originated in 2006 and 2007, coupled with the strengthening U.S. economy. Based on this sentiment, investor groups should continue to diversify their portfolios by being both geographically and product-type diverse in 2016. The portfolio lenders with a finite allocation are particularly careful of both geographic and product-type concentrations. They are sensitive to wisely assure their investments are appropriately spread between multiple geographic regions and asset classes. In 2016, multifamily and industrial will continue to be the most widely sought-after asset classes. While office and retail are also desirable investments, these product types require a more careful underwriting process, taking into consideration tenant quality and lease rollover exposure. Lender Sentiment and Focus. This year, the four different investor groups will bring varying advantages to the capital markets — both complementary and competing. Banks and thrifts bring local knowledge, flexible terms, and a commitment to their trade area. A good example is the coastal communities where rent and values exceed most other markets. The local banks and thrifts that are in these markets are comfortable with the higher loan per square foot for those property owners seeking higher leverage and loan-to-values. However, due to their cost of funds, their terms tend to be shorter and rates slightly higher. The CMBS market has provided an infinite amount of capital to the real estate industry. Although occasionally cyclical and volatile, the CMBS market has met a demand for the higher-leverage borrower seeking to maximize loan proceeds or properties that don’t fit the investment criteria for the other investor groups at very reasonable rates. Agency and GSEs, such as Freddie Mac, Fannie Mae, and the Department of Housing and Urban Development, have always been the best alternative for the better-quality multifamily asset class. Life insurance companies, although the smallest of the commercial and multifamily investor groups, have always been the “best terms” alternative. Due to their cost and availability of managed funds, property owners with good quality assets seeking lower leverage for the longest terms at the lowest rate would most probably find the life insurance companies their best option. A good example of complementary and competing options is a recent transaction in which our firm was hired to replace the maturing loans that we had placed on a portfolio of 12 shopping centers in Southern California 10 years ago. The $154 million portfolio of loans ranged from $5 million to $36 million, with loan-to-values ranging from 50 to 75 percent. The loans also ranged from 10-year terms amortized over 30 years to 20-year terms fully amortized. In the current market landscape, we found that the best option for our client was to place this request with four different sources: two life insurance companies and two CMBS lenders. By doing so, we were able to secure financing that met the client’s current needs, while also utilizing the variety of benefits provided by these varying capital sources to complement one another to our client’s advantage. Overall, based on the continued strong market fundamentals including availability of capital, low long-term interest rates, and the still low cost of capital, the 2016 capital markets will remain healthy and provide an opportunistic environment for continued growth and investment within the real estate sector. In addition, investor groups will remain vigilant in diversifying their portfolios both geographically and by product type, while owners and investors seeking to invest in real estate will continue to benefit from the diverse range of capital sources available. No Replies to "Rising interest rates will not upset the apple cart this year."